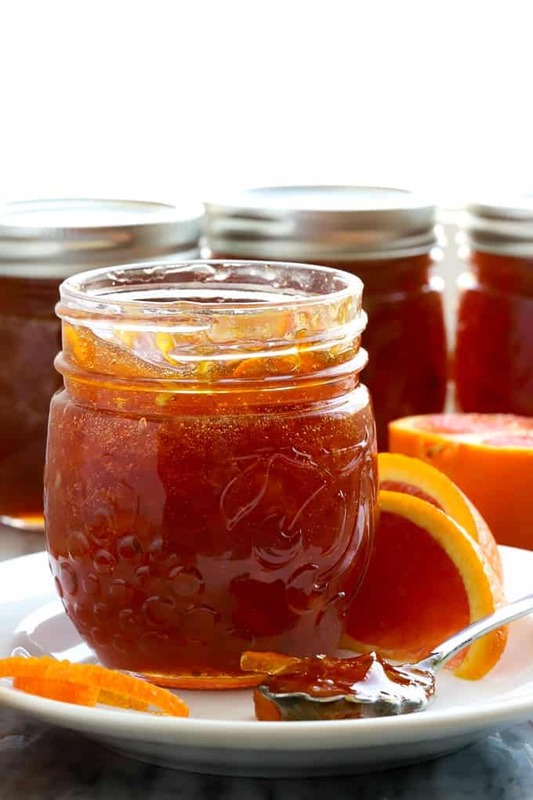 The varieties of homemade orange marmalade that you can create are home are endless. 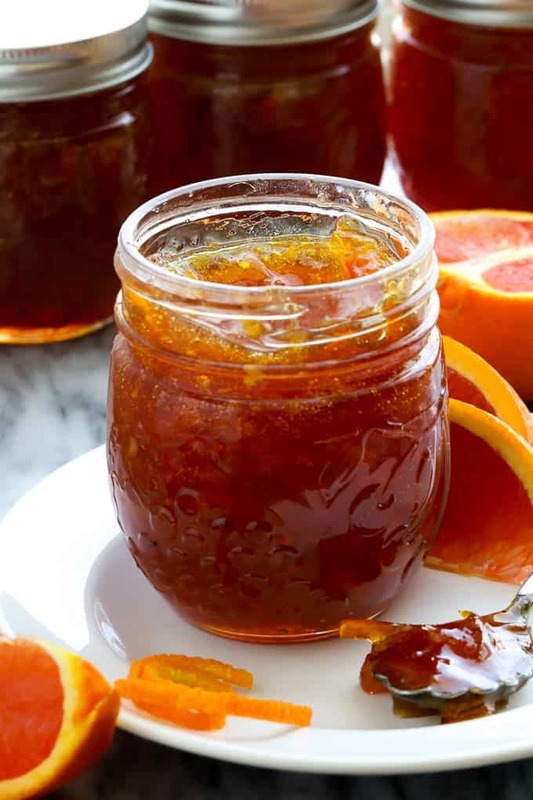 Take advantage of winter citrus season and make this cara cara orange marmalade recipe. The bright flesh of cara cara oranges is stunning! Making homemade orange marmalade is a labor of love but truly worth the effort. It is a time consuming overnight process, yet the hands on active time is minimal. 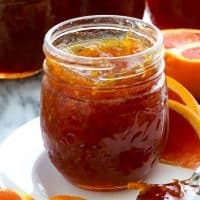 This recipe for cara cara marmalade follows the same steps from the Ball Blue Book of Preserving. Instructions for citrus orange lemon marmalade and a blood orange marmalade are other variations I welcome you to try. Day one: Prepare the oranges by separating the peel from the pith (the white inner part). Break up the orange flesh in the food processor. Let the mixture sit overnight to soften the peels. Day two: Cook the fruit mixture, add the sugar, and bring to a boil. Process with the boiling water canning method or store in the refrigerator. What is a cara cara orange? Cara cara oranges are a type of navel oranges. You likely wouldn’t know the difference just looking at a cara cara orange tree. The outer peel is orange similar to a navel orange but the interior orange flesh is the hidden secret– it is a deep pinkish-orange! If you didn’t realize that you purchased a different type of orange then you will be happily surprised upon slicing into this citrus. 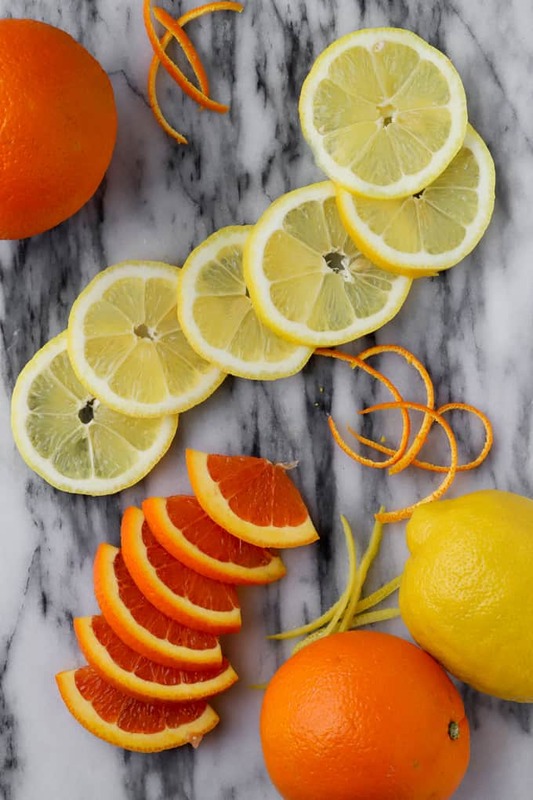 These oranges are easily confused with a grapefruit or even a blood orange due to their color, but their taste doesn’t compare to a tart grapefruit. Cara cara oranges are sweet and bright and usually don’t have large seeds so they are easy to enjoy. When is cara cara orange season? Cara cara oranges are a winter citrus fruit and are available in U.S. grocery stores during the winter months and sometimes into the spring. Separate the peel from the pith. The pith is the white, bitter layer under the peel. 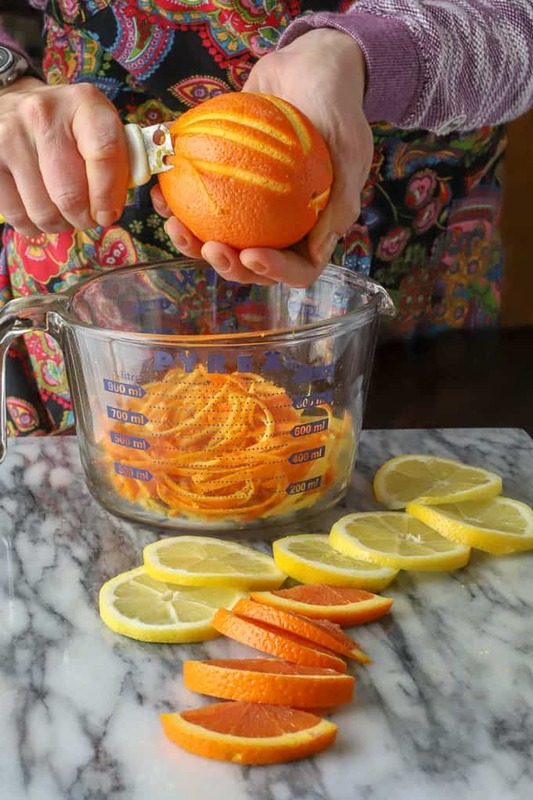 Begin by using a citrus peeler. 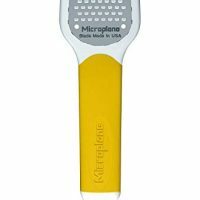 (I like this citrus microplane that Amazon sells.) The peeler ONLY takes the zest of the orange off and leaves behind the white, thicker layer called the pith. 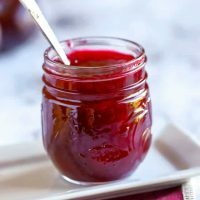 Pith is not great for eating due to its bitterness but it is valuable in the jam making process because the pith contains pectin, a natural substance that helps your homemade preserves reach a setting point. Now slice the fruit and remove the seeds. Take off the layer of pith and set it aside with the seeds. Wrap the seeds and pith in a cheesecloth bundle and secure tightly. This bundle will come into play shortly. 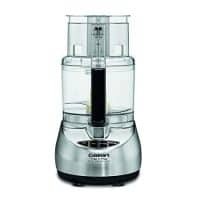 Use a food processor to break down the blood oranges and lemons. Pulse the fruit to bits. Place the water, all of the processed fruit, the peels, and the cheesecloth containing the pith and seeds into a large pot. Let this mixture sit overnight (not refrigerated). 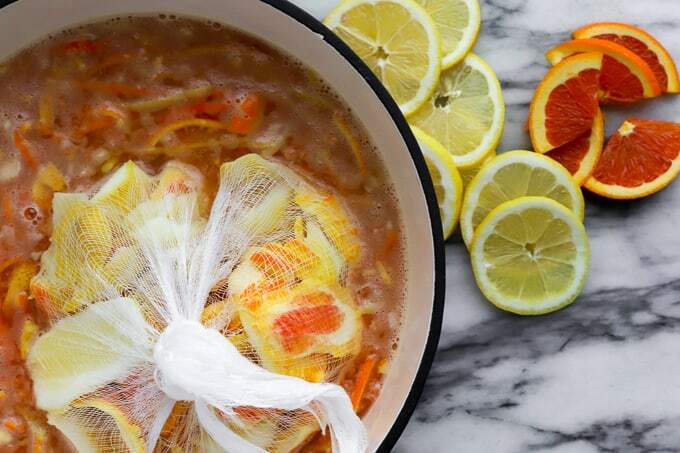 Bring the fruit mixture to a boil and cook for 20-30 minutes or until the peel is tender. 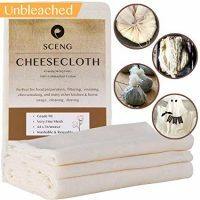 Remove from the heat and discard the cheesecloth bundle. This next step may sound inconvenient but it’s the best way to find out how much sugar is needed. Pour the marmalade mixture out of the hot sauce pan and into a large measuring glass. You’ll need to find out how much liquid and fruit bits you have in order to get the proportion correct for fruit to sugar. Add the sugar. Bring to a boil and stir until the sugar is dissolved. Cook the mixture until it reaches the gelling point. Ladle the hot marmalade into prepared jars, leaving 1/4 inch head space. 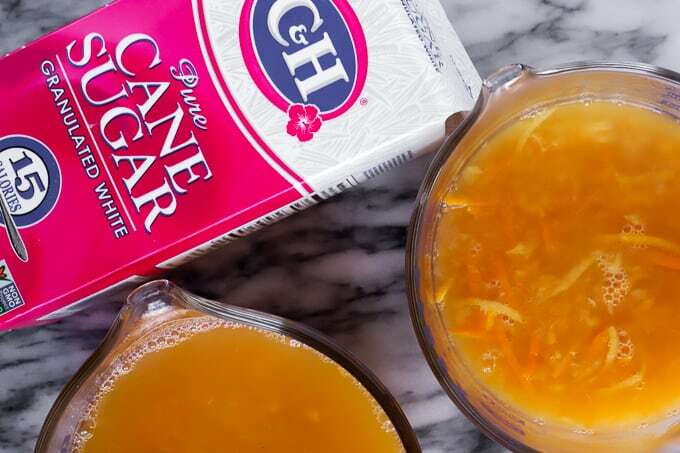 The varieties of homemade orange marmalade that you can create are home are endless. 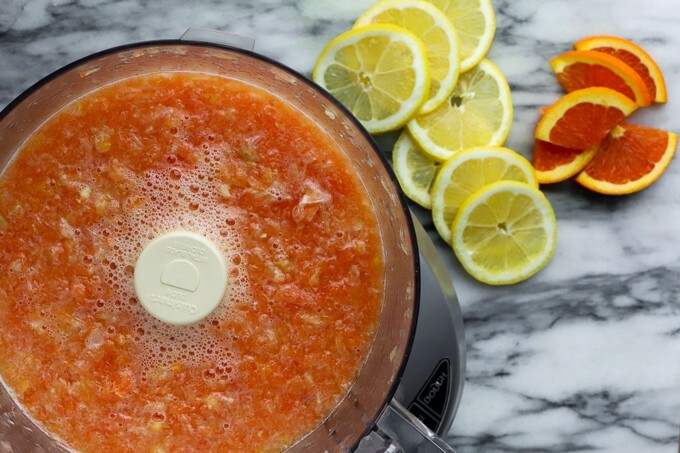 Take advantage of winter citrus season and make this cara cara orange marmalade recipe. First work on the peel: I use a carrot peeler to take a thin layer of peel off the oranges and lemons. You do not want the pith—the white layer just below the peel. The pith has pectin and will be used later but do your best to keep it separate from the peel. You should have about 3 cups of orange peel and 2 1/2 to 3 cups of lemon peel. Slice it thinly. Reserve any pith that has come off the fruit. Now slice the fruit and remove the seeds. Take off the layer of pith if it is thick. Set it aside with the seeds. Wrap the seeds and pith in the cheesecloth and secure tightly. 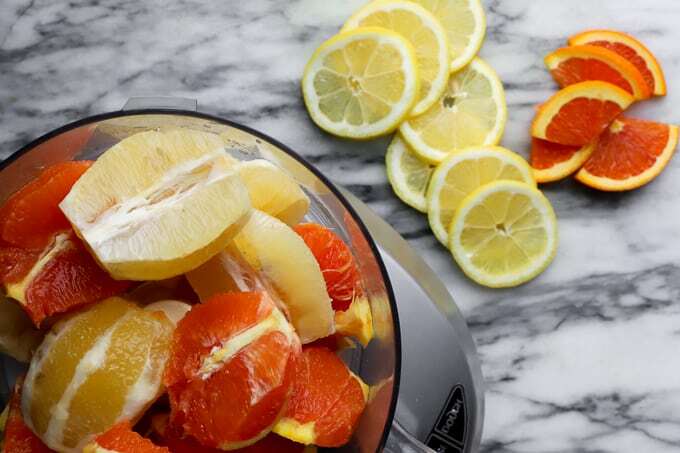 Use a food processor to break down the oranges and lemons. Pulse until the mixture is in small bits. The fruit will continue to break down when you cook it and marmalade is often a chunky mixture. Place the water, all of the processed fruit, the peels, and the cheesecloth containing the pith and seeds into a large pot. Let this mixture sit overnight (not refrigerated). Note that you do not add the sugar until Day Two. Measure the fruit and liquid. Add 1 cup sugar for each cup of fruit mixture (yes, this will be a lot of sugar). Bring to a boil and stir until the sugar is dissolved. Continue stirring as the mixture comes to the gelling point. The mixture will thicken, keep stirring. Perform a gel-test to see if the marmalade is ready for canning. Take a tablespoon of the marmalade and place it in the freezer for a few minutes on a very cold plate. After a few minutes, if the marmalade wrinkles when you push it slightly then it has reached the gelling point. Ladle the hot marmalade into prepared jars, leaving 1/4 inch head space. Process in a boiling-water canner. Alternatively, place the marmalade in the refrigerator if you do not wish to preserve it in a canner. 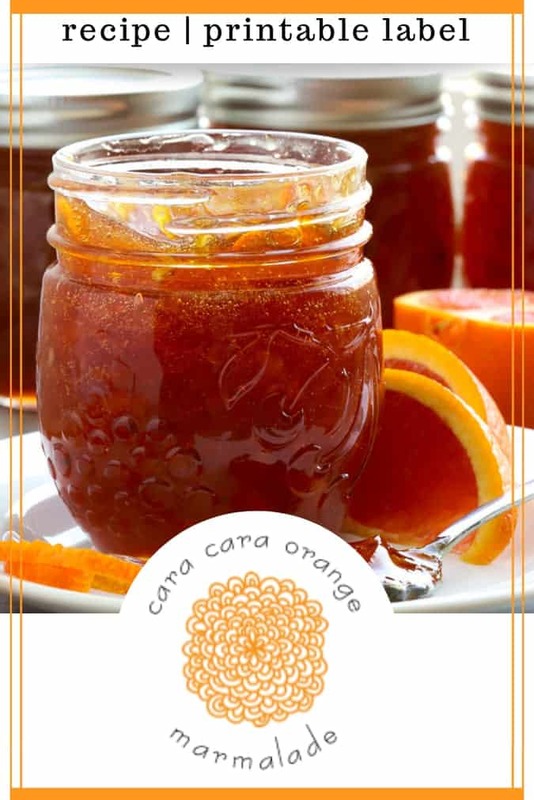 ADD A LABEL TO YOUR JAR OF CARA CARA ORANGE MARMALADE! Access is free to my email subscribers. Join the growing number of email subscribers by using the form below. You’ll love this label for your homemade marmalade! Here are homemade canning and preserving recipes that you can create in your kitchen! 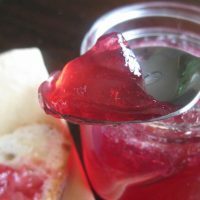 Making grape jelly at home is easier than you think. Follow these instructions adapted from Certo Liquicd Fruit Pectin. 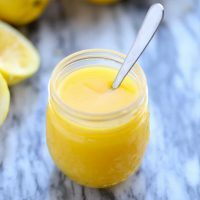 Making Lemon Curd has never been so easy-- the microwave is a fantastic short cut! Your Cara Cara Marmalade looks so delicious! I love love love Cara Cara oranges. It’s always so exciting when they start hitting store shelves in my area. I’ve never tried to make marmalade, but this seems very doable! Thanks, Lauren! 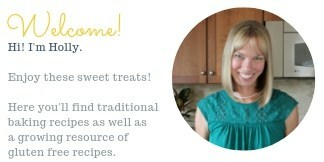 Hope you give marmalade a try. It is a bright burst of citrus on a winters day! I’ve never made marmalade but I do happen to have a bunch of Cara Cara oranges in the fridge right now. I think I might experiment with this tomorrow!